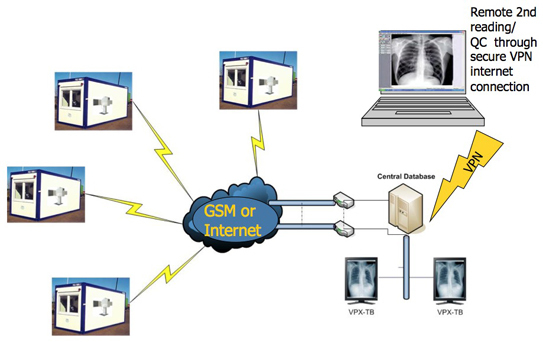 Medical images can be automatically sent to a central database in a diagnostic centre using the internet. Here experienced radiologists can interpret the images and the result is relayed to the unit in the field. Tele-radiology allows for equity as patients in remote areas can also obtain expert reading of radiographs. With digital radiology, issues such as developing films, transporting the films for (2nd) reading to the specialist hospital and poor image readability are all eliminated. Telecommunication: The acquisition and storing method of the images facilitates transmission over low bandwidth connections. With GSM networks being more and more available in almost all places in the world, it is possible to send images from virtually anywhere. It typically takes 30 seconds to transmit a PA chest X-ray from the field to the central database or any other location. Central archiving and reading: A nationwide concept based on linking all units to a central database. This enables the National Tuberculosis Program (NTP) to monitor and conduct quality assurance and centralize valuable TB data for research. Reading: All images are stored on a central location but can be read from virtually anywhere. Secure VPN connections to the database make it possible –using the WEB- to read images from any part of the world. Even low bandwidth connections can be used. Experienced readers to be involved in the interpretation of the images, can read the images at their convenience with respect to both place and time.